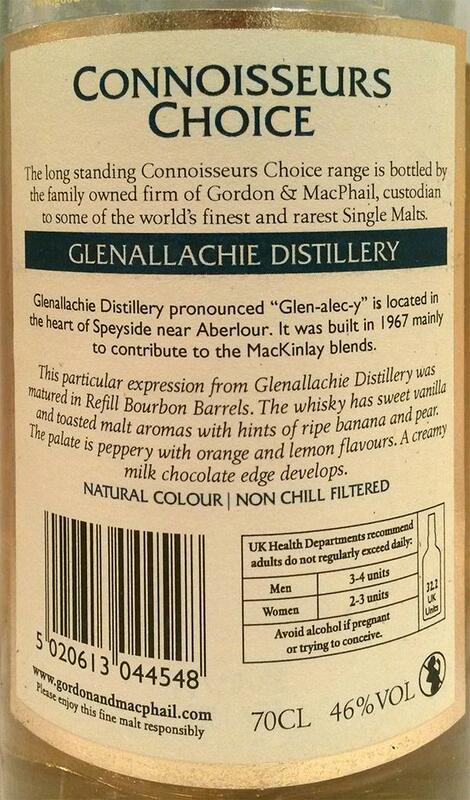 Glenallachie 1999/2015 (46%, Gordon & MacPhail, Connoisseurs Choice, refill bourbon) Colour: white wine. Nose: typical easy fruity unsherried Speysider. Not a lot to say, except that it’s very nice, easy, and fruity. Apples, barley syrup, pear cake, cherries, light honey (acacia), and only a drop of custard… Mouth: simply very good, flawless, middle-aged Speysiders, with orchard fruits, sweet barley, and honey. All that is perfectly balanced, and I would happily have a few cls for breakfast. On weekends! Finish: a little short but clean, barleyish, and lightly honeyed. A limony side in the aftertaste, always welcome. Comments: this one doesn’t need a lot of literature, it’s all pleasure and simplicity, without the caramelly background that can be found in large –volume brands stemming from the same region. Why do you always need names? ;-) Excellent and recommended. SGP:541 - 85 points.